It’s better known for appearing on chocolate boxes, tea towels and calendars. Certainly the merchandisers have made more money from the Monarch of the Glen than the man who painted it. 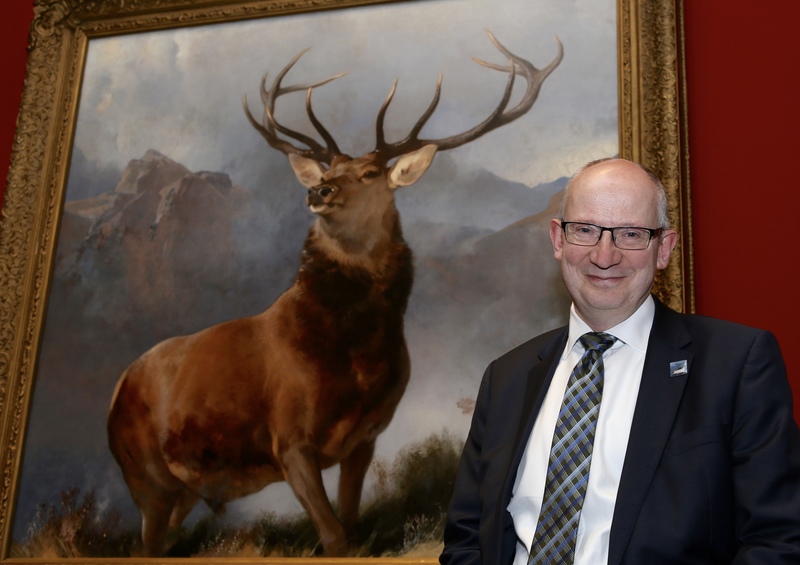 “The detail is exquisite and you can almost feel the wet nose of the stag,” says Sir John Leighton, director general of the National Galleries of Scotland which has just raised £4 million to buy one of the iconic pieces of Scottish art. Monarch of the Glen by Sir Edwin Landseer sits in a category of popular paintings such as Constable’s Haywain as arguably more famous for decorating consumer products than as a great work. He is convinced that the £4m, raised from the National Lottery, Scottish Government and a last minute public appeal, is money well spent and that the art world is not alone in regarding Monarch of the Glen as Landseer’s masterpiece. As the work was unveiled at the gallery to confirm that the funding was in place, a steady flow of visitors were eager to view it and grab a photo. “There is something memorable about the simplicity of the image. The natural pose of the animal. It has become the pose we expect to see in a stag,” says Sir John. He reveals that the gallery believes it will become such a draw that it is already considering it as a replacement for another iconic Scottish painting – Raeburn’s Skating Minister – as the signature image to promote the gallery on its own merchandise. Sir John says Landseer may not have been in the top ten, but he was a “great artist” who has captured an image with “a life of its own”. Belfast-born Sir John studied fine art in Edinburgh and returned to the city to take up his current post in 2006 after working in London and Amsterdam. Before this latest acquisition his most notable deal for the NGS was the purchase of Titian’s Diana and Actaeon and the Artist Rooms collection. In recognition of his contribution to the arts, he was awarded an honorary degree from the University of Edinburgh in 2009 and a Knighthood in December 2012. His attention will now turn to resuming work on the delayed extension following the decision to revisit the £16.8 million plans which have proved to be more costly that first expected. NGS intends the Hoskins Architects-designed extension to transform access to its collection of Scottish art which has been consigned for years to an outdated basement area. However, the project has been delayed after technical challenges emerged – believed to include work on the foundations – and tenders for the work came in above budget. Interserve, which is also working on the nearby Haymarket development, has issued about 60 sub-contract packages for the extension. “Some of the tenders came back higher than we had hoped, so for the next few weeks we are doing ‘value engineering’,” says Sir John. He admits some of the tenders were “considerably higher” but adds that it is normal to “refine” projects from early estimates. “This is specialist work and in some cases there are only two or three firms who can do it. But they also have other options. The market in Edinburgh is very heated – there is a lot of construction work around, and then you have contractors pricing for the political uncertainty. He says the gallery will “pause for a while” while it looks again at the budget and examines what needs to be done. The gallery board expects to reveal the revised programme by May, he said. The gallery will remain open throughout the building work, and is hoping to continue the upward trajectory of visitor numbers. Figures due shortly will show last year was another record attendance. “We have benefited from downturns in Paris and Brussels but also because culture is becoming more accessible to the public,” he says.